Gianandrea Noseda and the BBC Philharmonic here present a fourth captivating volume of orchestral works by Alfredo Casella, part of our on-going Musica Italiana series. In 1912, with his music for the �choreographic comedy� Le Couvent sur l�eau, Casella demonstrated that stylistic versatility was no disadvantage for a ballet composer, and although Diaghilev turned down the work for the Ballets Russes, Casella selected the highly colourful and once popular �symphonic fragments�, heard here, for concert use. 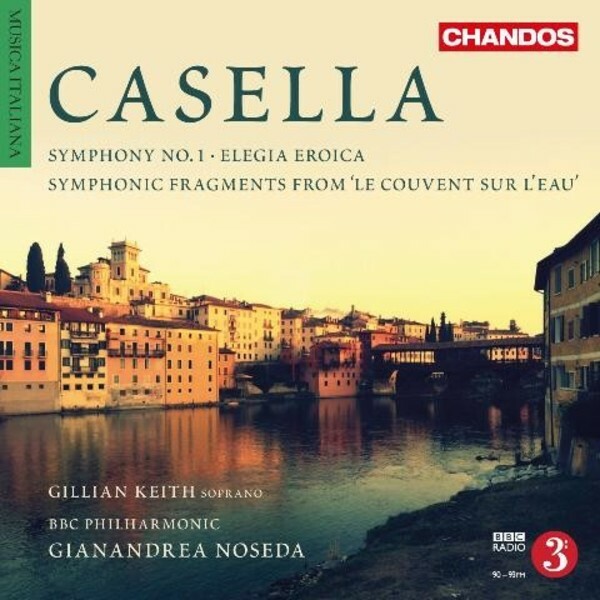 Similarly, the Elegia eroica is stylistically eclectic, constructed, according to Casella, as a �vast triptych�, opening with a dissonant funeral march and ending with a comforting, tuneful lullaby. Casella wrote this piece, which he dedicated �to the memory of a soldier killed in the war�, after Italy had entered the First World War and suffered enormous losses. The three-movement Symphony in B minor is an early work (1906) of creative energy and burning conviction, in which Casella�s enthusiasm for Russian music is revealed already in the sombre Mussorgskyan opening theme. This hypnotic first movement is almost pleasantly oppressive in comparison to the gentler, melodious second, and the bold final movement represents the adventurous exploits of an ambitious young composer.